↑ Foster, Gordon (1966). "INTERNATIONAL STANDARD BOOK NUMBERING (ISBN) SYSTEM original 1966 report". informaticsdevelopmentinstitute.net. ओरिजनल से 30 April 2011 के पुरालेखित. पहुँचतिथी 20 April 2014. ↑ 2.0 2.1 "ISBN History". 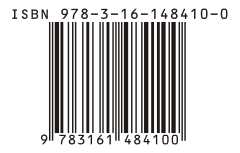 isbn.org. 20 April 2014. 20 April 2014 के ओरिजनल से पुरालेखित. पहुँचतिथी 20 April 2014. ↑ 3.0 3.1 3.2 Manwal ghall-Utenti tal-ISBN (PDF) (Maltese में) (6th संपा.). Malta: Kunsill Nazzjonali tal-Ktieb. 2016. प. 5. ISBN 978-99957-889-4-0. ओरिजनल (PDF) से 17 August 2016 के पुरालेखित. ↑ US ISBN Agency. "Bowker.com – Products". Commerce.bowker.com. पहुँचतिथी 2015-06-11. ↑ Gregory, Daniel. "ISBN". PrintRS. पहुँचतिथी 2015-06-11.